Well, today's post is something a little different. I did touch on it briefly on Facebook the other day, and well, here it is! 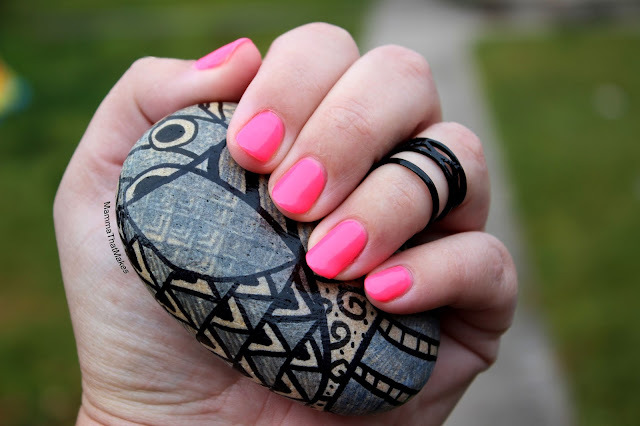 Some of you may know, that last year I became an independent Jamberry consultant! 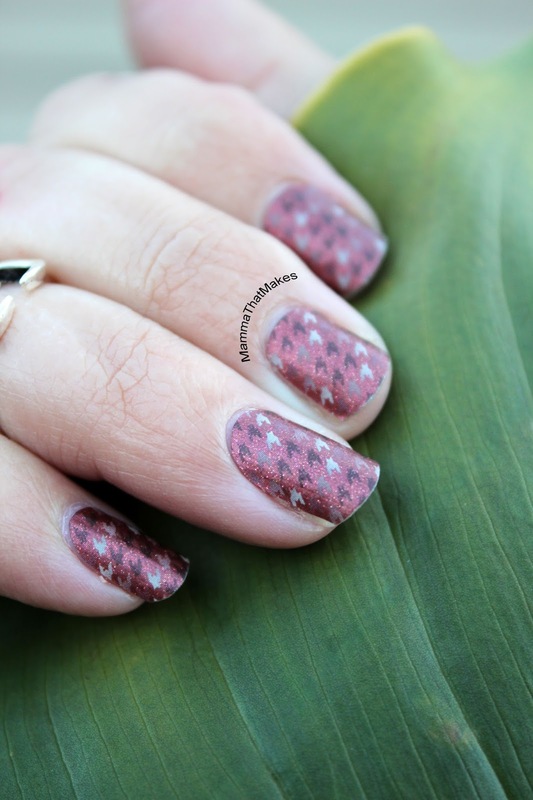 I love nails, I love manis and I love a good pattern! But I was forever ruining my pretty nails with my craft work. I'll be forever thankful to my amazing friend for introducing me to Jamberry products! Now,it's my second job, and it helps pay for all the supplies I use to bring you guys new patterns! Now that's a win win right? RIGHT! I LOVE taking photos, and taking nailfies is no exception! But it seems a shame for most of the photos to just sit on my harddrive, to never see the light of day. 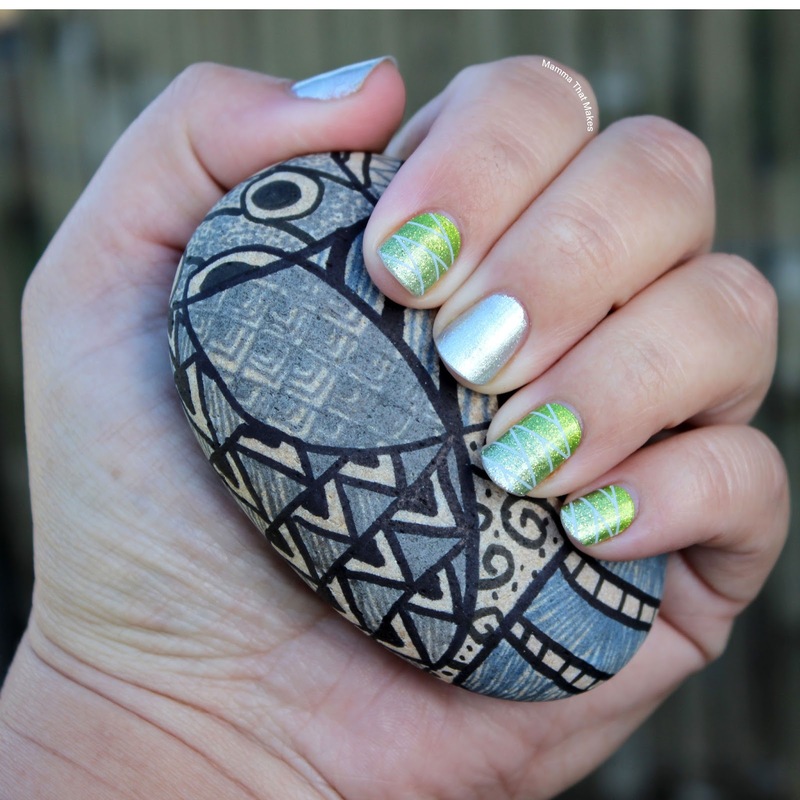 So once a month, I'm going to share with you my mani's! Psst, if you are here as a fellow JamSista, feel free to use the images, but please credit me! 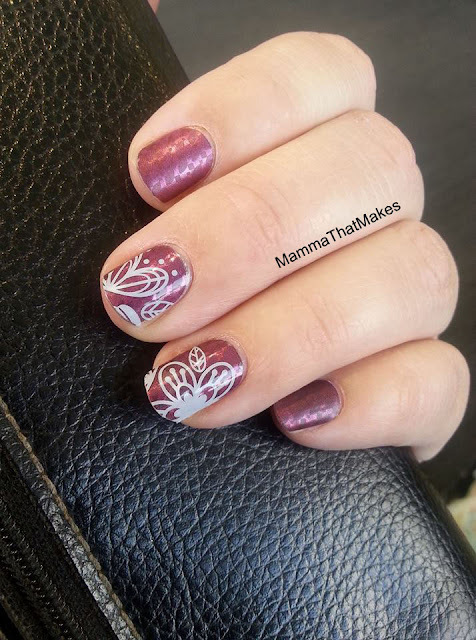 This mani is solely Jamberry wraps, this one is called On The Ritz. Its so pretty! It reminds me of old 8-bit games! My bottle of Cherry Bomb arrived, and I decided to have some fun with it! 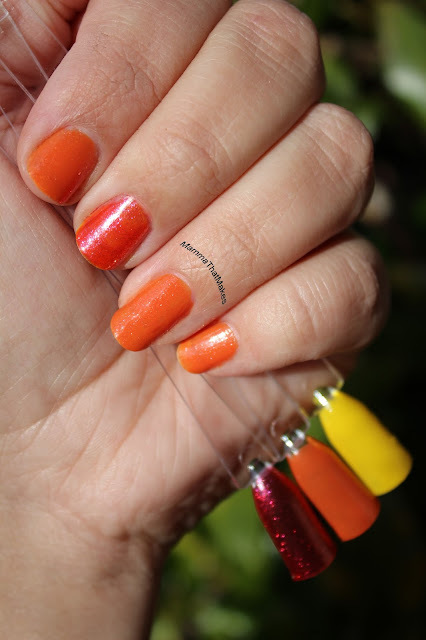 So I mixed it with equal parts of Lemon Drop to create this amazing orange colour! Normally I just layer lacquers (which is what I did on my middle finger) but woah mixing creates a whole new look! Im keen to use this orange again come Halloween! 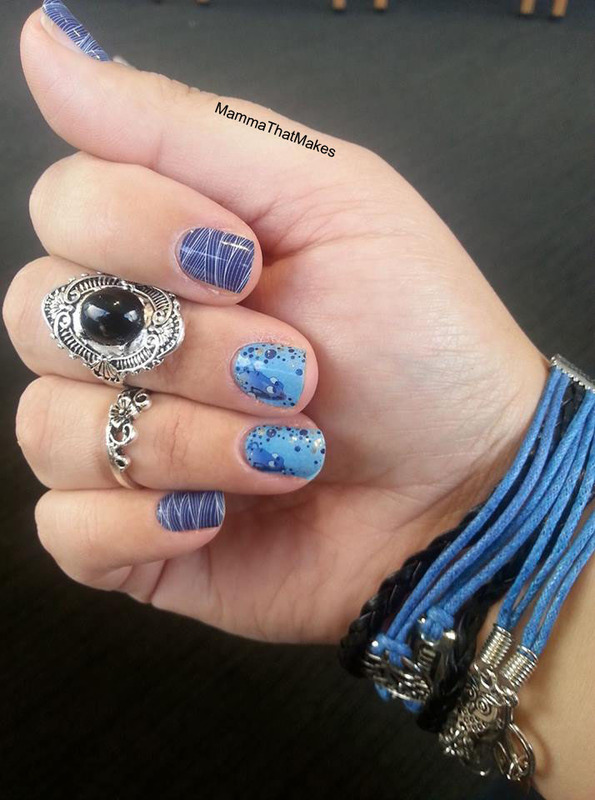 This mani was achieved using a clear wrap and layering it over a solid one! The bottom wrap is a beautiful slightly patterned one called Blackberry Bliss. The clear and white floral design I layered with is Dreaming Of You. 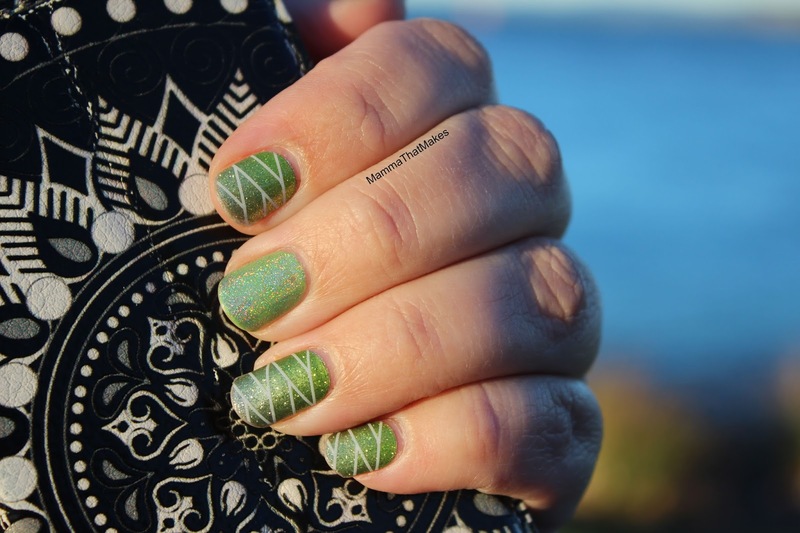 I just LOVE this mani! Actually, the kids picked it out for me. It's a combination of 2 wrap designs. Oh Bubbles, from the Disney Collection by Jamberry, paired with High Tide. Green is my absolute FAV colour, and I was kicking myself for not wearing this years Colour Of The Year wrap, Glittering Greenery yet! So I paired it up with Paparazzi Lacquer! Then a week later my bottle of That Glo Tho, the new Holographic silver polish came in and I had to test it out! So I took off Paparazzi and painted 2 layers of Greenery Godess and one light coat of That Glo Tho over the top. WOAH pretty! 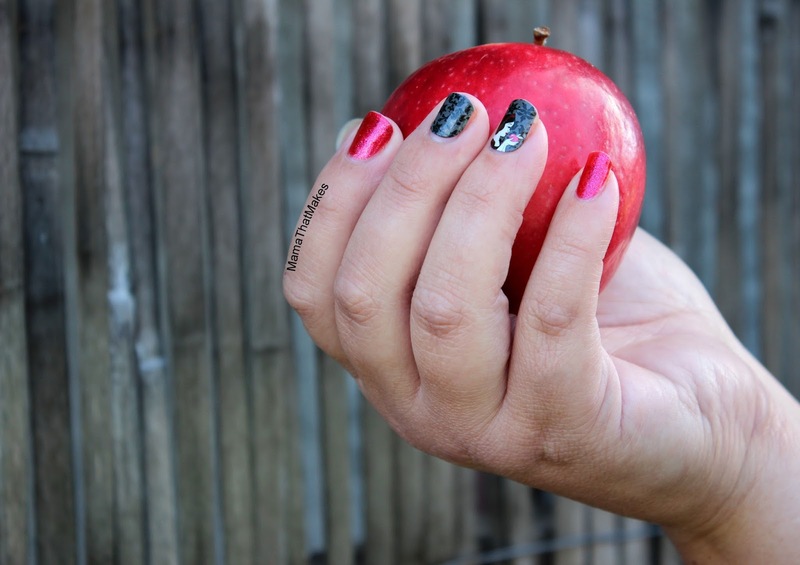 I still wasn't finished playing with the Cherry Bomb lacquer, so I used it again, and paired with with The Fairest, another from the Disney Collection by Jamberry. I can't get enough of that bright cherry glittery BOOM! My last mani for the month! I finally splurged out on myself and ordered the Jamberyy TruShine system, and I wish I had have done it sooner! This is the gel called Mr DJ. BAM! Take that all other pinks! Woah this colour is so me! So there you go peeps, my July mani's! Im so happy with these and my Jamberry journey. Some of the products I've used are now retired, but don't worry, there are always new designs and colours! Now it's back off to crocheting for me! Itty Bitty Giant hat Drive is only just a month away! EXCITING!